Suitable for thin phone case within 3mm, not fits for metal / bulky phone case,or thicker than 3mm phone case., Besides, the magnetic plate should centrally placed. 1.Choose car air condition vent holder, unscrew the fastening ring counterclockwise, remove the holder base, setup standard air condition vent holder, clockwise rotating the fastening ring tightly, choose the space of fixed claw to rotate tightly according to blade size of air condition. 2.Adjust the right angle to place mobile phone first, then clockwise rotating the fastening ring tightly, installation complete. QI wireless car charger comes with a standard retractable USB cable whose length is up to 33.5 inch (85 CM). This usb cable can insert the cigerate lighter car charger of most cars, you don't need to worry about it. ★Magnetic Design - Stable attaching your phone on any road conditions because of 4 strong built-in magnets inside the charger and magnetic patch.Paste the magnetic plate between your phone and your phone case so that your phone will hold tightly on the charger. ★2 Methods of Use - 360 degree rotation magnetic car mount/holder used on the car Air Vent or dashboard (two different gaps of the holder base fit for different air vent). 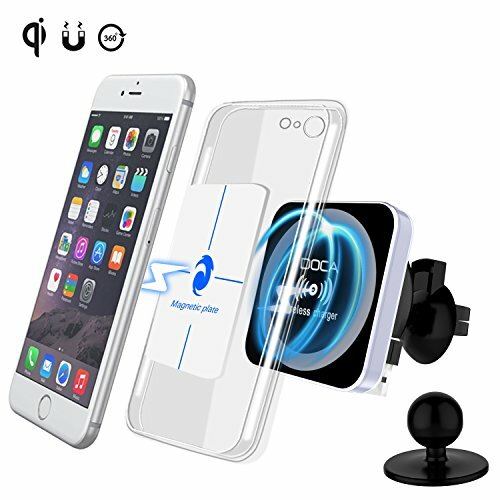 Car mount has swivel ball allowing 360 degree all direction rotation. You can easily adjust the viewing angle of your cell phone. ★Thin case - This phone holder is for thin case within 3mm or just charge directly. If the magnetic force is not strong due to the thick phone case, please stick a magnetic plate(included) between the back of your phone and your phone case. ★High Compatibility - Support all QI mobile phone models such as Galaxy Note 8, Galaxy S7/S7 Edge, Galaxy S6/S6 Edge, Galaxy S8, Galaxy S8 Plus,Nexus 4/Nexus 5/Nexus 6, Nokia 9/Nokia Lumia 920/1020/928/Lumia 950xl /950, HTC 8X (not UK version), HTC Droid DNA / Rzound,iPhone X iPhone 8/8P. ★Warranty & Package - 100% customer satisfaction. 1 Year worry-free return warranty and lifetime friendly. Package Includes: 1 * Wireless Car Charging Holder、1 * Sticker、1 * Magnetic plate、1 * Manual.